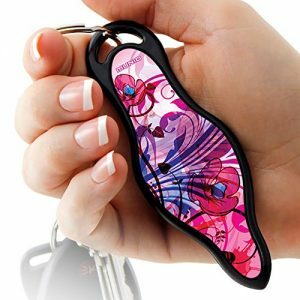 The MUNIO Designer Self Defense Keychain is a stylish evolution of self defense tools that have been used successfully throughout history for protection, and can easily empower you to fight off an attacker so you can escape safely. The name MUNIO (moon-yo) comes from a Latin word meaning “I protect” or “I defend”… and that's exactly how it can help you and your loved ones. MUNIO is legal in all U.S. states and is recommended by law enforcement and self defense professionals as a simple, effective, nonlethal, self defense product. It can be carried openly anywhere, making it ready to use immediately. MUNIO is also travel friendly and can be taken through TSA security and onto an airplane. MUNIO's ergonomic shape makes it comfortable to hold and carry. It is compact and easily fits in your pocket or small purses. As a bonus for women, MUNIO makes it easier to find your keys in your purse. The dimensions of MUNIO are 4.625″ long x 1.5″ wide x 0.125” thick. At only 1 ounce (including the 3 key rings it comes with), MUNIO is lightweight, putting less stress on your car ignition. MUNIO is a great alternative to pepper spray and stun guns. MUNIO has no shelf life, it never needs charging, and MUNIO's performance won't be affected by windy or rainy weather, or potential mechanical failure. MUNIO also works against a full spectrum of potential attacks, including, overlooked, but very common, attacks from behind. There is also no risk of chemical discharge or electrical shock, making MUNIO safer around small children as well. MUNIO is professionally decorated with designer artwork on both sides using a special UV printing process that makes MUNIO scratch and wear-resistant. MUNIO is made in the USA of high-strength, impact resistant, virtually unbreakable ABS plastic.